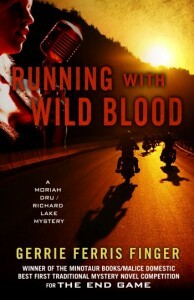 The following is a guest post by Gerrie Ferris Finger, author of Running With Wild Blood. If you would like to write a guest post on my blog, please send me an e-mail at contact@cecilesune.com. I don’t outline the first part of the story. I call myself a scene builder and write the story like a reader. I want to know myself what comes next? Where is the story taking me? Who are these people and which one(s) will murder? Because murder is going to happen. It’s a mystery. I don’t know much after I’ve come up with a riveting first and second scene or chapter. But I know if I’ve got a sound story brewing, it’s time to flesh out characters and action in heretofore and following scenes. A novel of 85,000-plus words had better have some poundage on its skeleton. The reader in me will have it no other way. I will also have figured out who murdered who and possibly why, but this is subject to change. Scene building is always fluid. That’s why it’s exciting. About half way through the story, I start considering the plot points, which is a way of thinking what should come next? It’s necessary, for no other reason, than to make certain that my story—well—has enough story to carry it through an entire novel. Right now, the novel I’m working on is nearing its dénouement, and this is where I began to outline plot points in order to push on to the end. So I jump ahead, leaving unfinished scenes behind, and still using my way of scene building, create future settings that are short and titled: “third body found” “boat missing” “mist obscures river bank.” I begin the action with the setting’s characters’ thoughts and words. These titled plot points become sub-chapters or even chapters. I’m never completely sure how long the characters are going to explore their surrounding, or how many conclusions they will jump to. It’s their story after all. I’ve already realized my ending is going to surprise with satisfactory twists. For me this concept not only works but was fun in the creation—despite angst at times. I discovered things I could never have outlined. Do I have to go back and create or modify chapters to fit new entanglements? Sure, but that’s fun, too. One thing I do after creating a character is I devote a few hand-written notebook pages to his or her description—if need be down to a crooked big toe. Also I make notes of the interaction of characters. I learned early after having wasted time word-searching through a manuscript to see how I portrayed a character. As a reader there’s nothing more irritating than to have Joe be dark and slim in the beginning; and by the end he’s blond and over-weight—unless he’s on the lam and dyed his hair and hung around in bars. Happy outlining or writing by the seat of your pants! About the author and her work: Gerrie Ferris Finger’s Website. Gerrie Ferris Finger is a retired journalist and author of several novels, six published in the Moriah Dru/Richard Lake series: The End Game, The Last Temptation, The Devil Laughed, Murmurs of Insanity, Running with Wild Blood and American Nights to be released May 18, 2016. 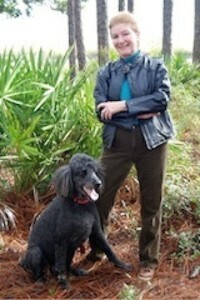 Ms. Finger lives on the coast of Georgia with her husband, Alan, and their standard poodle, Bogey.